Learn, revise and practice exam questions for PSLE Tamil composition. 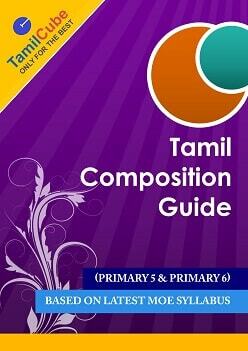 Includes study materials and online practice questions for PSLE Tamil composition (Paper 1). Tamilcube Academy provides model compositions and important & useful Tamil composition phrases suitable for P5, P6 & PSLE Tamil exam preparations here. These phrases can be used for oral exam practice too. The phrases are categorised under different situations for easy understanding and retention. Registration is free! If you are a new user, please register and login to continue with this FREE course. Once logged in, simply click the “Take this course” button above. A very useful collection of Tamil compositions and Tamil composition phrases suitable for normal Tamil and higher Tamil for upper primary level. Tamil phrases useful for composition and oral exam. இனிய தொடர்கள். கட்டுரைக்கு இந்த இனிய தொடர்களை பயன்படுத்தலாம்! It was very helpful…thanks a lot! very useful for Tamil composition.